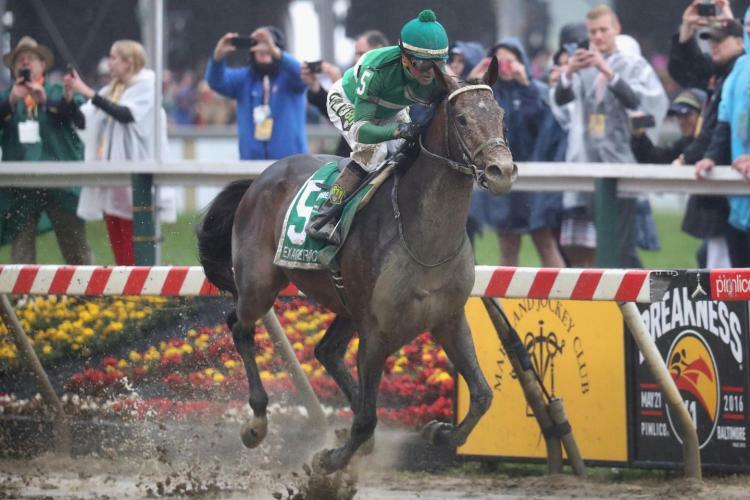 Exaggerator, ridden by Kent Kent Desormeaux won the Preakness by 3 1/2 lengths today. Nyquist broke sharply and battled for the lead with Uncle Lino, running the fastest opening quarter in the Preakness at 22.38. Unfortunately the fast speed and the muddy track took their toll and Nyquist faded to third with Cherry Wine sneaking in to beat him by a nose. The blazing pace took its toll on Uncle Lino, too, who was vanned back to the start. Vets found superficial digital flexor tendon inflammation in his left front leg. Sadly, the Preakness day was marred by two tragedies — 9-year old Homeboykris, a died shortly after winning the first race of the day. He came from behind to win the race but then collapsed on the way back to the barn. Preliminary reports suggest the gelding suffered from cardiac arrest, but a necropsy is planned. Three races later, 4-year old Pramedya broke her left-front canon bone in a turf race and had to be euthanized. Tragically, the filly was owned by Gretchen and Roy Jackson, who also owned 2006 Kentucky Derby winner Barbaro who was also injured in the Preakness.